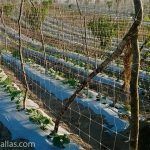 Cucumber netting, allowing the plant to trellis… naturally! Tutoring cucurbitaceae with cucumber trellis netting is a rewarding endeavor as the moment a horticulturist allows this kind of techniques to be used to train the cucumber plant. 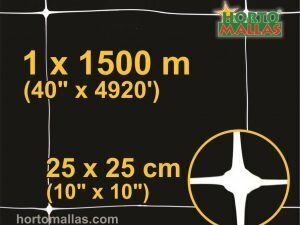 Like most cucurbits the idea of training these type of plants is to let the plant´s natural ability to climb do the actual trellising work instead of manually moving and attaching the plant to the trellis system. Cucumbers have an orbiting or coiling tendril system that searches for a point of attachment to some existing structure or plant. These cucumber tendrils spin naturally (in very slow motion) until they run into HORTOMALLAS cucumber trellis netting´s meshes, and start coiling fastening the point of contact to the Gherkin plant. As the plant keeps on growing naturally upwards, new tendrils will sprout and do the same coiling dance to support the plant vertically. Nature is very wise as we all know as it uses efficient ways to reach its equilibriums and self-sustainability, as Francis Bacon wrote “nature can only be commanded by obeying her” and HORTOMALLAS cucumber trellis netting allows nature to act it course and do what is best for the plant itself. Cucumbers “know” that in order to grow healthy they must stand tall and vertically above the ground, as a way to prevent the plant to be affected by humidity borne pathogens and to allow its fruits to reach full maturity. The coiling tendrils nature endowed the Gherkin plant as a way to attach itself to pre-existing spin as the plant grows and seek a cane or existing shrub to hook on to. 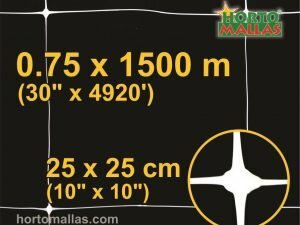 HORTOMALLAS acts as that permanent and rigid structure these tendrils are looking for. 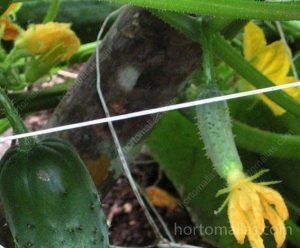 Once the cucumber vine detects the trellis netting the tendril will start coiling around HORTOMALLAS´ vertical or horizontal strands and act as a support for the next growth phase. 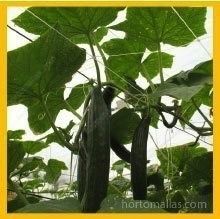 The peduncle of a gherkin is strong enough to support the weight of the fruit (HORTOMALLAS cucumber trellis netting can withstand up to 65 kilos per linear meter, unfortunately for the grower no cucumber plant can reach these weight limits) even if the plant is growing at 90 degrees from the ground, so there will not be any detrimental issues with chocking. 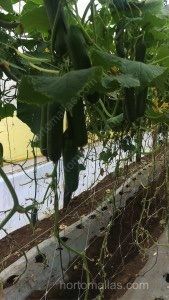 Unlike cucumbers grown on the soil that will have a yellowish tone on the side they were in contact with the humidity of the ground or mulch, gherkins cucumbers grown on HORTOMALLAS trellising net will have an even green color that the market pays more for. 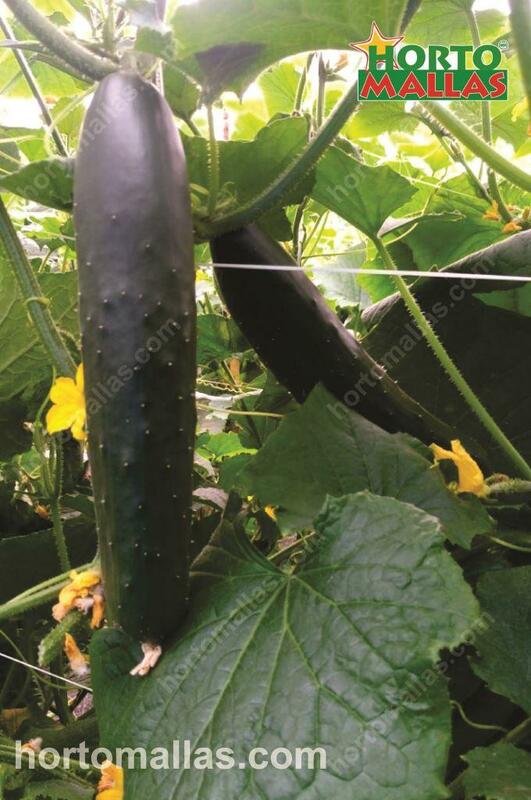 The cucumber trellis net prevents the fruits of gherkin from coming in contact with moist soil thus prevent the spread of diseases by fungi or bacteria growing in soil moisture. 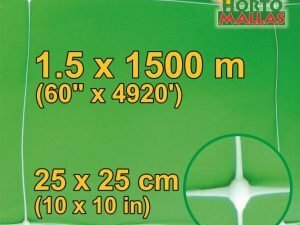 Allowing gherkins to grow vertically and away from the ground with HORTOMALLAS will save the grower many spraying of agrochemicals as the plant will have drier leaves and be less affected by diseases, especially fungal and bacterial ones, as the meshes allow the plant to extend at 360 degrees as compared to tutoring on raffia where the plant is only allowed to grow on the twine. Also compared to the raffia twine system the cucumber trellis netting does not need an operator to continually touch the plant in order to guide it upwards, and this reduces the mechanical contagion of diseases by the hands of the workers and mechanical stress which is known to reduce crop yields between 8 to 10%, due to the time it takes for the plant to readjust to the new position and the abrasion and flower and young fruits losses due to handling. The cucumber trellis netting does not need an operator to continually touch the plant to guide it upwards, and this reduces the mechanical contagion.